When you arrive in San Francisco, one of the first things you see is the dense, post-modern downtown office area. 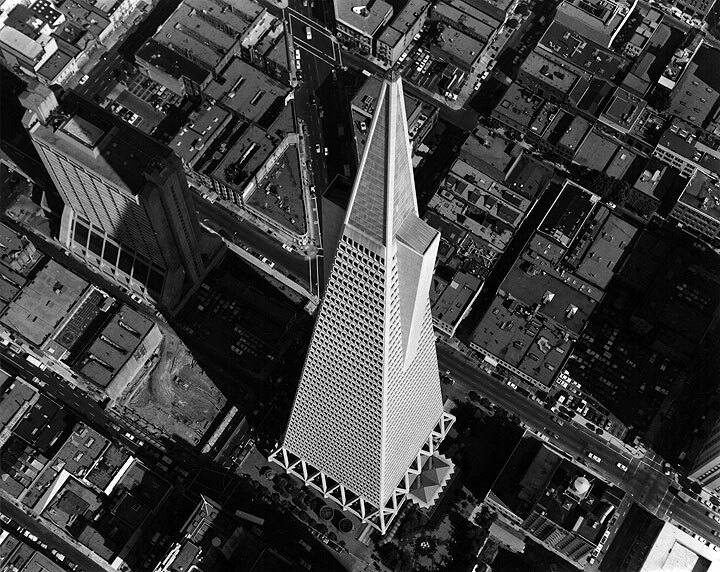 The distinctive Transamerica Pyramid, the towering Bank of America building, and countless other anonymous soaring boxes, spires, and cascading facades make up what is known locally as the "Manhattanization" of San Francisco. The downtown Financial District has more than doubled in the past 15 years. Neighborhood activists, identifying the growth of downtown as an assault on living standards and a spur to further housing inflation, managed to pass by popular vote Proposition M in 1986. Prop M is known as the most severe growth restricting legislation anywhere in the U.S., but it's true function is to legitimize the continued growth of downtown to twice its current size. The area south of Mission Street and east of Third Street was designated as the only area that could have new highrises built in it. As a result, it is gradually being converted from old warehouses and factories to the southern half of downtown. Of course, the Prop M legislation limited how many new square meters of office space could be built in a given year, and it also allows the city to subject architectural designs to an annual "beauty contest." But a soaring vacancy rate and changes in the tax law eliminating some fiscal inducements were leading to a contraction in office construction, anyway. By 1994, new construction was largely on hold. Locals rarely pause to wonder why all these buildings are here, and perhaps more importantly, what goes on inside all this real estate? A quarter of a million people make their way to the financial district Monday through Friday, many of them from distant suburbs, and the majority of them come to "handle information," the vital activity that occupies more and more of our society's time and wealth. If you look at San Francisco as the center of a huge metropolitan region of 6 million residents, and add the millions of square meters of office space that surround the once-flourishing Bay, the quantity of information being "handled" every day in this area is even more staggering. Of course it hasn't always been this way. As recently as 1934, San Francisco was paralyzed by a General Strike when waterfront longshoremen closed the Port of San Francisco over wages and arbitrary hiring practices. Police shot and killed two strikers, and workers throughout the city went on strike in protest. This event gave San Francisco unions a a strong political presence, which has been lost in the past decades with the transformation of the city from a blue- to a white-collar economy, and the gradual elimination (through restructuring) of the unions' power base. 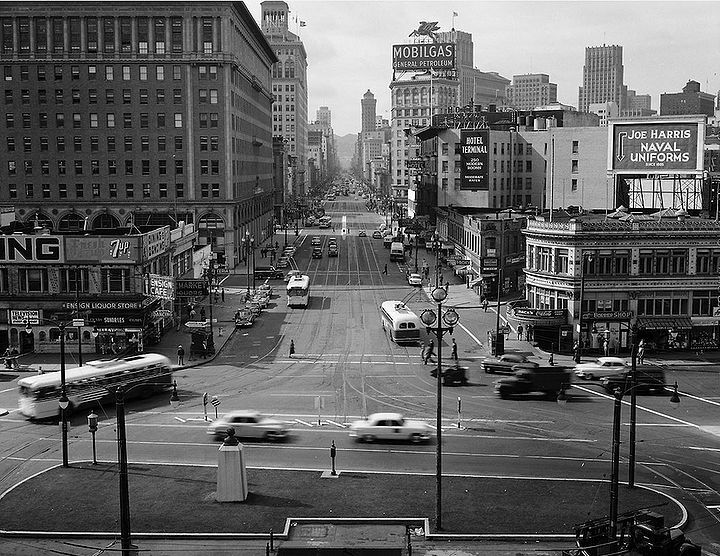 View west on Market Street from top of Ferry Building, Oct.13, 1953. Unionization of bank workers or other office workers remains extremely rare, with the exception being most government and university employees. The limited inroads made as a result of social pressure in the 1960s and '70s were abruptly reversed nationally by Reagan's election and the smashing of the Air Traffic Controllers union (PATCO). In San Francisco the same reversal of union fortunes was achieved by a devastating strike at Blue Shield insurance company in 1980-81. In spite of some militant acts by various groups of strikers, the strike ultimately lost when the union signed a contract that left union workers in possession of 150 jobs instead of the 1,500 they had at the strike's start. Other efforts at traditional union organizing among private sector workers have failed in 1980s San Francisco. "Women Organized For Employment," an organization affiliated with the national group "Working Women" and the Service Employees Union, went bust in 1983 after a few desultory campaigns against gender discrimination on the job. Independent efforts to organize in the banks got nowhere. "Bankworkers United," a small group at Crocker Bank in the 1982-83 period, published a newsletter for over a year and no doubt pressured management on its abusive, arbitrary and exploitative labor relations. But by mid-decade they were gone, and soon Crocker Bank was, too, when it was swallowed by Wells Fargo. Today the Bay Area as a whole is extremely diversified economically, featuring heavy industry, oil refineries, major ports, the famous Silicon Valley, many universities, numerous military bases and other government offices, and thousands of small businesses serving the needs of larger corporations, government agencies, and the 6 million residents. San Francisco's number one industry is tourism, which includes hotels, restaurants, entertainment, and retail sales. But the Financial District lends San Francisco a good deal of its current identity. It is home to 75 major banking offices, including five of the top 100 U.S. banks. It is also home to the federal government's Federal Reserve Bank for the Pacific region. Many large brokerage houses cluster in the Financial District near the Pacific Stock Exchange, while 14 of the Fortune 500 companies have their headquarters in San Francisco. The Bank of America (2nd largest in the U.S.), Chevron Oil Company (one of the world's 10 largest companies), Bechtel (the largest engineering firm in the world), Pacific Gas & Electric (the U.S.'s largest privately owned utility, providing gas and electricity to half of California), and Levi-Strauss (the world's largest clothing manufacturer) all make San Francisco their home. Major accounting, law, insurance, advertising, data processing, and management consulting firms all have offices in San Francisco. A dozen large hospitals and the University of California's San Francisco hospital complex comprise another large piece of S.F. 's municipal economy. The clothing business is big in the city, with the wholesale Apparel Mart on Market and the booming Showplace Square area over the former Mission Creek swamp shore, and semi-hidden sweatshops dotting the landscape in many neighborhoods.